A group of nine Sinningia species, nested within the Dircaea clade, have a single distinguishing characteristic in common: the flower has an overhanging upper lip, formed by the fusion of the two uppermost corolla lobes. This overhanging upper lip is called a galea, from the Latin word for "helmet". 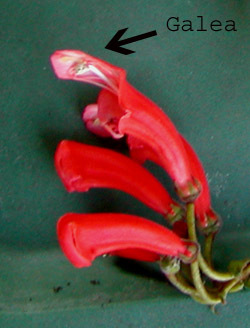 When the flower opens, the anthers protrude from the tube, but remain under the galea, facing downward. When a hummingbird sticks its beak into the flower tube to sip some nectar, the anthers deposit pollen on the bird's forehead. Later, in the flower's female phase, the stamens curl downward, bringing the anthers out of the way beneath the flower. The style extends, pushing the receptive stigma out of the tube and under the galea, in the same position that the anthers were in a few days earlier. In this way, the stigma is ready to pick up the pollen that another flower of the same species has deposited on the bird's forehead. Tubular flowers without galeas mostly deposit pollen on the bird visitor's beak. There are, however, exceptions. Species with anthers which protrude outside the floral tube ("exserted anthers" in botanist speak) can apply pollen to the area above a bird's beak. An example of such a species is Sinningia sellovii. 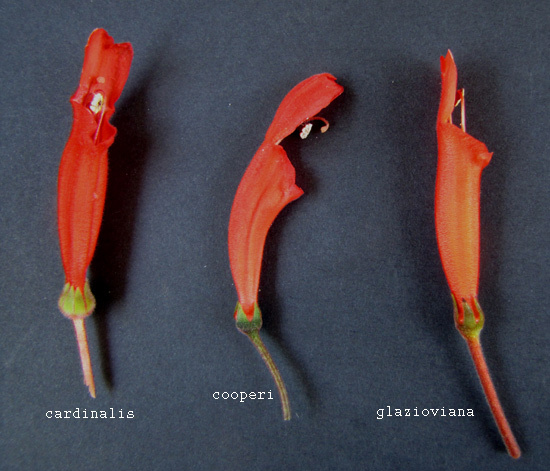 This shows the galeate flowers of three species: S. cardinalis, S. cooperi, and S. glazioviana. I was quite surprised to discover that the flowers were almost the same size. There are small differences in the shape of the corolla tube (that of S. cooperi is wider and more curved), in the calyx, and in the color of the pedicel, but considering the differences in plant habit (S. cooperi is a pendant epiphyte, S. cardinalis an upright shrub, and S. glazioviana a spreading herb), the floral differences are small. In many hummingbird-pollinated sinningias, the two upper corolla lobes project somewhat beyond the end of the tube. A good example is S. araneosa, but its overhanging lip is formed by two overlapping corolla lobes which are not joined for most of their length. In the definition I use here, a galea is formed by the two upper corolla lobes which are fused over most of their length. Also, the galea should be at least 1.5 cm [more than half an inch] long. Some species in the genus Columnea (as defined before Dalbergaria, Trichantha, and Pentadenia got lumped into it) also have galea. Obviously, this is a case of parallel evolution, since Columnea and Sinningia are only distantly related. They didn't get it from a common ancestor, but developed it independently, in response to the same selective circumstances. There are two notable differences between the columnea galea and the sinningia galea. The sinningia galea is composed of the two upper corolla lobes ("petals"). The columnea galea is composed of those same two lobes, but the two side lobes get pulled in to contribute a little lateral support for the galea. The bottom three corolla lobes of a galeate sinningia flower are small. The bottom lobe of a galeate columnea flower is usually bent back underneath the corolla, to get it out of the way. I suspect that the sinningia galea evolved not by addition of something, but by subtraction. Instead of the upper two lobes of the corolla increasing in size, to project beyond the end of the primitive corolla tube, it seems to me that what happened is that the bottom three lobes shrank. If this were the case, then the style and filaments (the stalks of the stigma and stamens, respectively) could remain the same size. In this situation, the development of the galea would not need an explanation; instead, the disappearance of the outer ends of the bottom three lobes would need one, and that would be provided by the positioning of the pollinator's head. In columneas such as C. schiedeana, the outer end of the bottom lobe doesn't disappear; instead it curls down under corolla. If the galea had developed by an extension of the upper two lobes, there wouldn't be any lower corolla section which needed bending back away from the corolla tip. It may be that galeate sinningias have evolved further than galeate columneas. Originally, the galeate sinningias might have done the same thing as the columneas, "reflexing" the excess tissue back out of the way, but eventually evolved a way of saving the material and energy which went into creating that excess tissue. It is also possible that the columneas have done something clever with the extra tissue, enlarging the attractive surface of the corolla. In this regard, it is worth noting that the "pseudo-galeate" sinningias, like S. araneosa, don't show any sign of a reflexed corolla underside. It may be that S. araneosa is on its way toward developing a galea, without ever passing through a columnea-like stage. Presumably, the almost complete fusion of the upper two lobes in galeate sinningias is due to a need for reinforcing the galea. If this is true, then one would expect that the descendants of S. araneosa might have completely fused upper lobes too. Let's check back in a hundred thousand years or so. The galea trait appears to be recessive. My cross S. reitzii (no galea) x cardinalis (galea) has flowers with no galea. The flowers have slightly extended upper corolla lobes, something like S. araneosa. S. cardinalis and S. eumorpha were crossed long ago, giving flowers with no galea. S. iarae has been crossed with S. conspicua and S. eumorpha: no galea. Selfing S. reitzii x cardinalis should, in theory, give 25% plants with galeate flowers (assuming that the galea is controlled by a single gene, which is not a sure thing). However, my casual attempts to self it have not yielded any seed so far. S. hatschbachii (galea) x glazioviana (galea) flowers do have a galea, as expected. It wasn't a complete certainty -- the two species could have different galea-forming genes, but that was unlikely, given their proximity in the sinningia taxonomic tree. It would be interesting to cross S. araneosa with one of the galea-group sinningias, to see what came out. There would be no F2, however, since the hybrid would almost certainly be sterile. The title of this page is a little play on the name of the company I used to work for, The Gale Group. Before it was bought by the Thomson Corporation and merged into Gale Research, my employer was Information Access Company, of Foster City, California. The company, whose flagship product was InfoTrac, found in better libraries all over, was founded by four guys, one of them named Buster.